This article is about the constellation. For the pattern of stars (asterism), see Big Dipper. For other uses, see Ursa Major (disambiguation). Appearing in the northern sky, Ursa Major occupies a large area covering 1279.66 square degrees or 3.10% of the total sky, making it the third largest constellations in the night sky. Eugène Delporte in 1930, who set the official International Astronomical Union (IAU) constellation boundaries, formed a 28-sided irregular polygon, which according to the equatorial coordinate system, stretches between the right ascension coordinates of 08h 08.3m and 14h 29.0m and the declination coordinates of +28.30° and +73.14°. Ursa Major borders eight other constellations: Draco to the north and northeast, Boötes to the east, Canes Venatici to the east and southeast, Coma Berenices to the southeast, Leo and Leo Minor to the south, Lynx to the southwest and Camelopardalis to the northwest. The three-letter constellation abbreviation 'UMa' was adopted by the IAU in 1922.
α Ursae Majoris, known by the Arabic name Dubhe ("the bear"), which at a magnitude of 1.79 is the 35th-brightest star in the sky and the second-brightest of Ursa Major. β Ursae Majoris, called Merak ("the loins of the bear"), with a magnitude of 2.37.
γ Ursae Majoris, known as either Phecda or Phad ("thigh"), with a magnitude of 2.44.
δ Ursae Majoris, or Megrez, meaning "root of the tail," referring to its location as the intersection of the body and tail of the bear (or the ladle and handle of the dipper). ε Ursae Majoris, known as Alioth, a name which refers not to a bear but to a "black horse," the name corrupted from the original and mis-assigned to the similarly named Alcor, the naked-eye binary companion of Mizar. Alioth is the brightest star of Ursa Major and the 33rd-brightest in the sky, with a magnitude of 1.76. It is also the brightest of the "peculiar A (Ap) stars," magnetic stars whose chemical elements are either depleted or enhanced, and appear to change as the star rotates. ζ Ursae Majoris, Mizar, the second star in from the end of the handle of the Big Dipper, and the constellation's fourth-brightest star. Mizar, which means "girdle," forms a famous double star, with its optical companion Alcor (80 Ursae Majoris), the two of which were termed the "horse and rider" by the Arabs. The ability to resolve the two stars with the naked eye is often quoted as a test of eyesight, although even people with quite poor eyesight can see the two stars. η Ursae Majoris, known as either Alkaid or Benetnash, both meaning the "end of the tail." With a magnitude of 1.85, Alkaid is the third-brightest star of Ursa Major. Except for Dubhe and Alkaid, the stars of the Big Dipper all have proper motions heading toward a common point in Sagittarius. A few other such stars have been identified, and together they are called the Ursa Major Moving Group. The stars Merak (β Ursae Majoris) and Dubhe (α Ursae Majoris) are known as the "pointer stars" because they are helpful for finding Polaris, also known as the North Star or Pole Star. By visually tracing a line from Merak through Dubhe (1 unit) and continuing for 5 units, one's eye will land on Polaris, accurately indicating true north. Another asterism known as the "Three Leaps of the Gazelle" is recognized in Arab culture. It is a series of three pairs of stars found along the southern border of the constellation. From southeast to southwest, the "first leap", comprising ν and ξ Ursae Majoris (Alula Borealis and Australis, respectively); the "second leap", comprising λ and μ Ursae Majoris (Tania Borealis and Australis); and the "third leap", comprising ι and κ Ursae Majoris, (Talitha Borealis and Australis). W Ursae Majoris is the prototype of a class of contact binary variable stars, and ranges between 7.75m and 8.48m. 47 Ursae Majoris is a Sun-like star with a three-planet system. 47 Ursae Majoris b, discovered in 1996, orbits every 1078 days and is 2.53 times the mass of Jupiter. 47 Ursae Majoris c, discovered in 2001, orbits every 2391 days and is 0.54 times the mass of Jupiter. 47 Ursae Majoris d, discovered in 2010, has an uncertain period, lying between 8907 and 19097 days; it is 1.64 times the mass of Jupiter. The star is of magnitude 5.0 and is approximately 46 light-years from Earth. The star TYC 3429-697-1 ( 9h 40m 44s; 48°14′2″, located to the east of θ Ursae Majoris and to the southwest of the "Big Dipper") has been recognized as the state star of Delaware, and is informally known as the Delaware Diamond. Several bright galaxies are found in Ursa Major, including the pair Messier 81 (one of the brightest galaxies in the sky) and Messier 82 above the bear's head, and Pinwheel Galaxy (M101), a spiral northeast of η Ursae Majoris. The spiral galaxies Messier 108 and Messier 109 are also found in this constellation. The bright planetary nebula Owl Nebula (M97) can be found along the bottom of the bowl of the Big Dipper. M81 is a nearly face-on spiral galaxy 11.8 million light-years from Earth. Like most spiral galaxies, it has a core made up of old stars, with arms filled with young stars and nebulae. Along with M82, it is a part of the galaxy cluster closest to the Local Group. M82 is a galaxy that is interacting gravitationally with M81. It is the brightest infrared galaxy in the sky. SN 2014J, an apparent Type Ia supernova, was observed in M82 on 21 January 2014. M97, also called the Owl Nebula, is a planetary nebula 1,630 light-years from Earth; it has a magnitude of approximately 10. It was discovered in 1781 by Pierre Méchain. M101, also called the Pinwheel Galaxy, is a face-on spiral galaxy located 25 million light-years from Earth. It was discovered by Pierre Méchain in 1781. Its spiral arms have regions with extensive star formation and have strong ultraviolet emissions. It has an integrated magnitude of 7.5, making it visible in both binoculars and telescopes, but not to the naked eye. I Zwicky 18 is a young dwarf galaxy at a distance of 45 million light-years. The youngest-known galaxy in the visible universe, I Zwicky 18 is about 4 million years old, about one-thousandth the age of the Solar System. It is filled with star forming regions which are creating many hot, young, blue stars at a very high rate. The Kappa Ursae Majorids are a newly discovered meteor shower, peaking between November 1 and November 10. HD 80606, a sun-like star in a binary system, orbits a common center of gravity with its partner, HD 80607; the two are separated by 1,200 AU on average. Research conducted in 2003 indicates that its sole planet, HD 80606 b is a future hot Jupiter, modeled to have evolved in a perpendicular orbit around 5 AU from its sun. The 4-Jupiter mass planet is projected to eventually move into a circular, more aligned orbit via the Kozai mechanism. However, it is currently on an incredibly eccentric orbit that ranges from approximately one astronomical unit at its apoapsis and six stellar radii at periapsis. Ursa Major has been reconstructed as an Indo-European constellation. It was one of the 48 constellations listed by the 2nd century AD astronomer Ptolemy in his Almagest, who called it Arktos Megale. [a] It is mentioned by such poets as Homer, Spenser, Shakespeare, Tennyson and also by Federico Garcia Lorca, in "Song for the Moon." The Finnish epic Kalevala mentions it , Vincent van Gogh painted it. It may be mentioned in the biblical book of Job, dated between the 7th and 4th centuries BC, although this is often disputed. The constellation of Ursa Major has been seen as a bear, usually a female bear, by many distinct civilizations. This may stem from a common oral tradition stretching back more than 13,000 years. Using statistical and phylogenetic tools, Julien d'Huy reconstructs the following Palaeolithic state of the story: "There is an animal that is a horned herbivore, especially an elk. One human pursues this ungulate. The hunt locates or get to the sky. The animal is alive when it is transformed into a constellation. 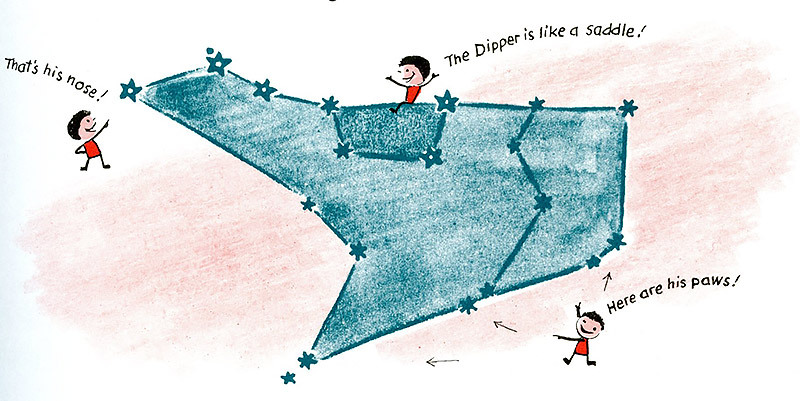 It forms the Big Dipper." In Burmese, Pucwan Tārā (ပုဇွန် တာရာ, pronounced "bazun taya") is the name of a constellation comprising stars from the head and forelegs of Ursa Major; pucwan (ပုဇွန်) is a general term for a crustacean, such as prawn, shrimp, crab, lobster, etc. In Roman mythology, Jupiter (the king of the gods) lusts after a young woman named Callisto, a nymph of Diana. Juno, Jupiter's jealous wife, discovers that Callisto has a son named Arcas, and believes it is by Jupiter. Juno then transforms the beautiful Callisto into a bear so she no longer attracts Jupiter. Callisto, while in bear form, later encounters her son Arcas. Arcas almost shoots the bear, but to avert the tragedy, Jupiter turns Arcas into a bear too and puts them both in the sky, forming Ursa Major and Ursa Minor. Callisto is Ursa Major and her son, Arcas, is Ursa Minor. In ancient times the name of the constellation was Helike, ("turning"), because it turns around the Pole. In Book Two of Lucan it is called Parrhasian Helice, since Callisto came from Parrhasia in Arcadia, where the story is set. The Odyssey notes that it is the sole constellation that never sinks below the horizon and "bathes in the Ocean's waves", so it is used as a celestial reference point for navigation. It is also referred to as the "Wain." One of the few star groups mentioned in the Bible (Job 9:9; 38:32; – Orion and the Pleiades being others), Ursa Major was also pictured as a bear by the Jewish peoples. "The Bear" was translated as "Arcturus" in the Vulgate and it persisted in the King James Bible. In the Finnish language, the asterism is sometimes called by its old Finnish name, Otava. The meaning of the name has been almost forgotten in Modern Finnish; it means a salmon weir. Ancient Finns believed the bear (Ursus arctos) was lowered to earth in a golden basket off the Ursa Major, and when a bear was killed, its head was positioned on a tree to allow the bear's spirit to return to Ursa Major. The Iroquois Native Americans interpreted Alioth, Mizar, and Alkaid as three hunters pursuing the Great Bear. According to one version of their myth, the first hunter (Alioth) is carrying a bow and arrow to strike down the bear. The second hunter (Mizar) carries a large pot – the star Alcor – on his shoulder in which to cook the bear while the third hunter (Alkaid) hauls a pile of firewood to light a fire beneath the pot. The Wampanoag people (Algonquian) Native Americans referred to Ursa Major as "maske", meaning "bear" according to Thomas Morton in The New England Canaan. The Wasco-Wishram Native Americans interpreted the constellation as 5 wolves and 2 bears that were left in the sky by Coyote. In Hinduism, Ursa Major is known as Saptarshi, each of the stars representing one of the Saptarshis or Seven Sages viz. Bhrigu, Atri, Angirasa, Vasishta, Pulastya, Pulalaha and Kratu. The fact that the two front stars of the constellations point to the pole star is explained as the boon given to the boy sage Dhruva by Lord Vishnu. Alkaid (Eta Ursae Majoris) has several nicknames: "Sword" 劍 (C: jiàn J: ken) (short form from "End of the sword" 劍先 (C: jiàn xiān J: ken saki)), "Flickering light" 搖光 (C: yáoguāng J: yōkō), or again "Star of military defeat" 破軍星 (C: pójūn xīng J: hagun sei), because travel in the direction of this star was regarded as bad luck for an army. The Lakota people call the constellation Wičhákhiyuhapi, or "Great Bear". 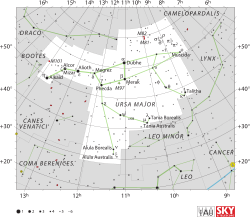 In European star charts, the constellation was visualized with the 'square' of the Big Dipper forming the bear's body and the chain of stars forming the Dipper's "handle" as a long tail. However, bears do not have long tails, and Jewish astronomers considered Alioth, Mizar, and Alkaid instead to be three cubs following their mother, while the Native Americans saw them as three hunters. Noted children's book author H. A. Rey, in his 1952 book The Stars: A New Way to See Them, (ISBN 0-395-24830-2) had a different asterism in mind for Ursa Major, that instead had the "bear" image of the constellation oriented with Alkaid as the tip of the bear's nose, and the "handle" of the Big Dipper part of the constellation forming the outline of the top of the bear's head and neck, rearwards to the shoulder, potentially giving it the longer head and neck of a polar bear. Ursa Major as depicted in Urania's Mirror, a set of constellation cards published in London c.1825. Johannes Hevelius drew Ursa Major as if being viewed from outside the celestial sphere. Ursa Major is also pictured as the Starry Plough, the Irish flag of Labour, adopted by James Connolly's Irish Citizen Army in 1916, which shows the constellation on a blue background; on the state flag of Alaska; and on the House of Bernadotte's variation of the coat of arms of Sweden. The seven stars on a red background of the flag of the Community of Madrid, Spain, may be the stars of the Plough asterism (or of Ursa Minor). The same can be said of the seven stars pictured in the bordure azure of the coat of arms of Madrid, capital of that country. ^ Ptolemy named the constellations in Greek, Ἄρκτος μεγάλη (Arktos Megale) or the great bears. ^ Schaefer, Bradley E. (November 2006). "The Origin of the Greek Constellations: Was the Great Bear constellation named before hunter nomads first reached the Americas more than 13,000 years ago?". Scientific American, reviewed at Brown, Miland (30 October 2006). "The Origin of the Greek Constellations". World History Blog. Archived from the original on 1 April 2017. Retrieved 9 April 2017; Berezkin, Yuri (2005). "The cosmic hunt: variants of a Siberian – North-American myth" (PDF). Folklore. 31: 79–100. doi:10.7592/FEJF2005.31.berezkin. Archived (PDF) from the original on 2015-05-04. ^ a b Ripley, George; Dana, Charles A., eds. (1879). "Charles's Wain" . The American Cyclopædia. ^ Reader's Digest Association (August 2005). Planet Earth and the Universe. Reader's Digest Association, Limited. ISBN 978-0-276-42715-2. ^ "Ursa Major, Constellation Boundary". The Constellations. International Astronomical Union. Archived from the original on 5 June 2013. Retrieved 16 August 2015. ^ "Charles' Wain". Retrieved 23 November 2017. ^ Prof. Jim Kaler, Stars: "Alioth" (2009-09-16), http://stars.astro.illinois.edu/sow/alioth.html. ^ See generally Mark R. Chartrand III (1983) Skyguide: A Field Guide for Amateur Astronomers, p. 195 (ISBN 0-307-13667-1). ^ Ridpath, at p. 136. ^ "Ursa Major & Ursa Minor". Winter Sky Tour. Archived from the original on 2012-12-19. ^ a b Levy 2005, p. 67. ^ "Planet 47 Uma b". The Extrasolar Planet Encyclopaedia. Paris Observatory. 11 July 2012. Retrieved 15 July 2012. ^ "Planet 47 Uma c". The Extrasolar Planet Encyclopaedia. Paris Observatory. 11 July 2012. Archived from the original on 14 September 2012. Retrieved 15 July 2012. ^ "Planet 47 Uma d". The Extrasolar Planet Encyclopaedia. Paris Observatory. 11 July 2012. Archived from the original on 19 October 2012. Retrieved 15 July 2012. ^ Delaware Facts & Symbols – Delaware Miscellaneous Symbols, delaware.gov. Accessed on line August 17, 2015. ^ Cao, Y; Kasliwal, M. M; McKay, A; Bradley, A (2014). "Classification of Supernova in M82 as a young, reddened Type Ia Supernova". The Astronomer's Telegram. 5786. Bibcode:2014ATel.5786....1C. ^ Levy 2005, pp. 129–130. ^ Seronik, Gary (July 2012). "M101: A Bear of a Galaxy". Sky & Telescope. 124 (1). ^ Laughlin, Greg (May 2013). "How Worlds Get Out of Whack". Sky and Telescope: 29. ^ Mallory, J.P.; Adams, D.Q. (August 2006). "Chapter 8.5: The Physical Landscape of the Proto-Indo-Europeans". Oxford Introduction to Proto-Indo-European and the Proto-Indo-European World. Oxford, GBR: Oxford University Press. p. 131. ISBN 9780199287918. OCLC 139999117. The most solidly 'reconstructed' Indo-European constellation is Ursa Major, which is designated as 'The Bear' (Chapter 9) in Greek and Sanskrit (Latin may be a borrowing here), although even the latter identification has been challenged. ^ Botterweck, G. Johannes, ed. (1994). Theological Dictionary of the Old Testament, Volume 7. Wm. B. Eerdmans. pp. 79–80. ISBN 9780802823311. ^ Allen, R. H. (1963). Star Names: Their Lore and Meaning (Reprint ed.). New York, NY: Dover Publications Inc. p. 207–208. ISBN 0-486-21079-0. Retrieved 2010-12-12. ^ Gibbon, William B. (1964). "Asiatic parallels in North American star lore: Ursa Major". Journal of American Folklore. 77 (305): 236–250. doi:10.2307/537746. JSTOR 537746. ^ Bradley E Schaefer, The Origin of the Greek Constellations: Was the Great Bear constellation named before hunter nomads first reached the Americas more than 13,000 years ago?, Scientific American, November 2006, reviewed at The Origin of the Greek Constellations Archived 2017-04-01 at the Wayback Machine; Yuri Berezkin, The cosmic hunt: variants of a Siberian – North-American myth Archived 2015-05-04 at the Wayback Machine. Folklore, 31, 2005: 79–100. ^ d'Huy Julien, Un ours dans les étoiles: recherche phylogénétique sur un mythe préhistorique, Préhistoire du sud-ouest, 20 (1), 2012: 91–106; A Cosmic Hunt in the Berber sky : a phylogenetic reconstruction of Palaeolithic mythology, Les Cahiers de l'AARS, 15, 2012. ^ "The Myths of Ursa Major, The Great Bear | AAVSO". AAVSO. Archived from the original on 2016-03-26. Retrieved 2016-04-24. ^ Hamilton, Edith Mythology New American Library, New York, 1942, chapter 21 (Callisto). ^ Mandelbaum, Allen; translator (1990). The Odyssey of Homer. New York City: Bantam Dell. ISBN 0-553-21399-7. ^ Thomas, Morton (13 September 1883). "The new English Canaan of Thomas Morton". Published by the Prince Society – via The Open Library. ^ Clark, Ella Elizabeth (1963). Indian Legends of the Pacific Northwest. University of California Press. ^ "English-Chinese Glossary of Chinese Star Regions, Asterisms and Star Names". Hong Kong Space Museum. Retrieved 17 December 2018. ^ The Bansenshukai, written in 1676 by the ninja master Fujibayashi Yasutake, speak several times about these stars, and show a traditional picture of the Big Dipper in his book 8, volume 17, speaking about astronomy and meteorology (from Axel Mazuer's translation). ^ Ullrich, Jan, ed. (2011). New Lakota Dictionary (2nd ed.). Bloomington, IN: Lakota Language Consortium. p. 956. ISBN 978-0-9761082-9-0. LCCN 2008922508. ^ "Archived representation of H.A. 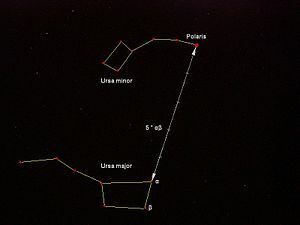 Rey's asterism for Ursa Major". Archived from the original on 2014-04-07. Thompson, Robert; Thompson, Barbara (2007). Illustrated Guide to Astronomical Wonders: From Novice to Master Observer. O'Reilly Media, Inc. ISBN 0-596-52685-7. 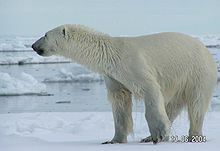 Wikimedia Commons has media related to Ursa Major.